Expensive, imposing, state of the art and...unusable. The DeskMill was brilliant on paper, but sadly lacking in person. Despite the incredible comfort of its well-engineered slats, we found this advanced treadmill to be simply too small for safe use as a treadmill desk base. Amazing "tank tread" technology feels wonderful on your feet. Power consumption is literally half of its nearest competitor, the LifeSpan TR5000. Regrettably unsuited for treadmill desking. The WoodWay is a brilliant piece of work, but it has some major design flaws that impact its practical performance. Doggy treadmill dimensions may make two-legged users nervous, and an outdated software controller can baffle non tech-savvy users. Noisier than all other walking treadmills. $7,000 price just makes no sense at all. Woodway's DeskMill looked really interesting, but suffered a poor performance when tested in the real world. The woefully-inadequate size and noise levels are concerns, and $7,000 is a mind-bogglingly expensive pricetag for a disappointing treadmill. The editorial team of WorkWhileWalking had the distinct privilege of putting the $7,000 Woodway DeskMill treadmill base through our full lab test, including getting feedback from real users. We tested only the base itself; the L-Desk shown in the picture was not provided. Following is our full report, and we have to say it was probably the most interesting device we’ve ever tested here, though our conclusion regarding its suitability for prime time treadmill desking was not a positive one. Since 1988, Woodway USA has been building super high-end treadmills based on a German technology first developed in 1975. It uses so-called “slat treads” (think “tank treads”) on 146 roller bearings and 6 belt glides instead of a two-roller single-piece conventional belt. You’ll find these monsters in NFL gyms, the homes of the rich and famous, rehab clinics and occasionally at high-end gyms. They have amazing performance characteristics and lots of very cool features, if you've got the pocketbook. 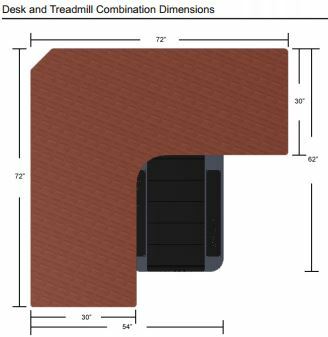 The DeskMill Treadmill Desk Base was born from the same technology as Woodway's world-famous "tank tread" treadmills, though it is significantly slimmer (7" high instead of about a foot high) and with a top speed of 4.0 mph; other models purportedly go up to 25 mph. Woodway didn't stray too far from their running treadmill roots when they installed their standard rubber "landing strips" on the left and right sides of the belt, embossed with "FOR THE LONG RUN". The first thing one notices about the DeskMill, however, is that it looks more like a doggy rehab treadmill, rather than one designed for human use. The unit was shipped to us exactly as you see it here but strapped down to a forklift pallet, without a stitch of cardboard to protect it from the elements. As such it was shipped by a moving company rather than a common carrier like UPS or FedEx Freight. Weighing a hundred pounds more than a LifeSpan TR5000 treadmill base, the DeskMill base tipped the scales at about 245 lbs. once off the pallet. Our first indication that this was going to be a little weird was that the delivery crew was surprised to find out we were not a veterinary clinic, being convinced this mystery package could be nothing but a doggy treadmill. Turns out they were not far off the mark, but we'll get to that later. Woodway has never formally announced this product, although the company has had a dedicated DeskMill page on their website for quite some time, and a Youtube video featuring the DeskMill has been out for several years. There is no posted price and it cannot be purchased online. According to Woodway's representative the official selling price of the unit as configured is $6,950. There are some inherent advantages to the DeskMill's design. Slat-treads and ballbearings don't create nearly as much friction as a conventional belt-type treadmill. The company claims that this also means less noise, 50% less power consumption, smoother action, and virtually a lifetime without maintenance. We put all these claims to test. Where conventional treadmills have to be regularly cleaned and lubricated and have their boards and belts replaced from time to time, Woodway claims that no preventative maintenance is required for the first 150,000 miles. At treadmill desk speeds that would exceed the life span of the typical user. Funnily enough even leading treadmill desk manufacturer LifeSpan Fitness doesn't make a treadmill that can go without maintenance for the entire "life span" of a typical user. That said, their top-end machine, the TR5000, is marketed as "maintenance free", yet costs $5K less than the Woodway - see our TR5000 review for details). Before sending us the treadmill, Woodway told us that the unit could be controlled either by a control console that physically sits on your desktop (no picture available), or via a Windows PC background application, or a Windows mobile application using a Bluetooth connection. There is no evidence that a control console actually exists. What arrived was a CD-ROM with software that seems it was written circa 2006, that required a laptop to be connected to the treadmill via a USB to DB9 converter cable. Haven't seen one of those in years. First we had to auto-configure a COM4 port to open communication between the laptop and the treadmill... again, a bit of a nostalgia trip. 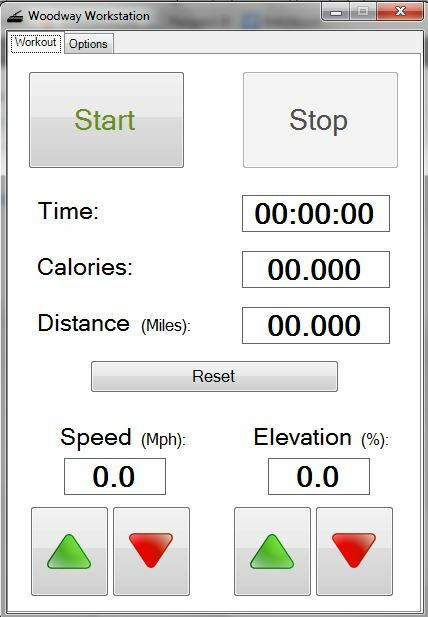 The user interface is basic, but it seems to be generic for all their treadmill models, including settings for things like Incline (the DeskMill has no incline function). We tried to look past the UI ugliness and just get the machine running, but to our amazement it was already running before we even had a chance to enter a speed setting! Just plugging the unit into the power socket and turning on the power switch caused the belt to start creeping slowly, at something like 0.1 or 0.2 mph. Only much later did we discover the setting on the configuration speed for resolving "belt creep." The factory explained that this may have been due to a difference in voltage between their facility and our building. Funny, we thought everyone in this country received 120V of juice out of the electrical socket - and we've never seen any other treadmill do this - but so be it. This was only a small problem in the bigger scheme of things as it turned out. Our inquiry as to whether the DeskMill was properly UL rated for use with a laptop or mobile phone based application was never answered. Ironically a red emergency pull cord was supplied, but there was no console to attach it to. 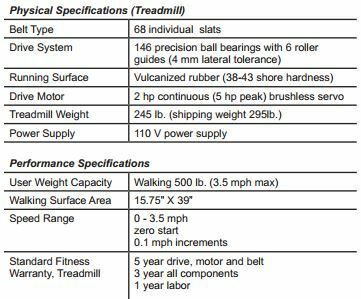 The weight capacity of the DeskMill treadmill base is rated at 500 lbs. at a full speed of 4.0 mph. That's an impressive 100 lbs. more than either the iMovR ThermoTread GT Office Treadmill or the LifeSpan TR5000-DT3 Treadmill Base. At 6.2" in step-up height the Woodway is a bit taller than the LifeSpan units, ThermoTread GT or Rebel Desk, but in length it has the smallest footprint compared to the Steelcase Walkstation, LifeSpan TR800, TreadDesk and all other bona fide walking treadmills that we've reviewed. Its 49" bumper-to-bumper length compares to 63" to 70" for most treadmills. That's the good news. The bad news is that the left and right "landing strips" you stand on when mounting or dismounting the treadmill are wider than on most other treadmills in order to accommodate the tank tread mechanism, leaving you with only a 15.75" belt width. 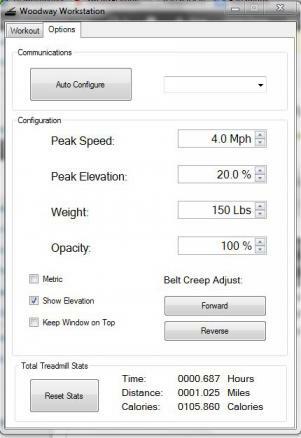 See our article on How Important is the Belt Width on a Treadmill Desk? for important considerations. The Desk-Mill's belt area is harrowingly 15.75" wide and 39" long, comprised of 68 individual rubber slats. Woodway's patented rubberized walking surface has been medically proven to absorb footstrike and be easier on joints and connective tissues, and every person who stepped on the Woodway rhapsodized about how comfortable it felt on the feet. Users can walk with dress shoes longer and more comfortably. Their patented near-frictionless precision ball bearing system allows the surface to gently glide without the noise of foot impact or the sound of the belt disturbing the user or coworkers. The tank tread itself has a life expectancy of 200,000 miles. Well, that's the marketing copy, anyway. But here's the bottom line. Every person who tried walking on the DeskMill's 15.75" wide belt felt threatened once we stepped the speed up over 1 mph. It is exceedingly difficult not to run into the landing strips with the edges of your shoes if you lose focus on walking a perfectly straight line even for a second. Worse, the belt is so short that even a very minor disruption to your focus - like reaching for the phone - could easily result in sliding off the back edge. Taller users reported feeling the last roller through their shoe soles at the end of their strides. 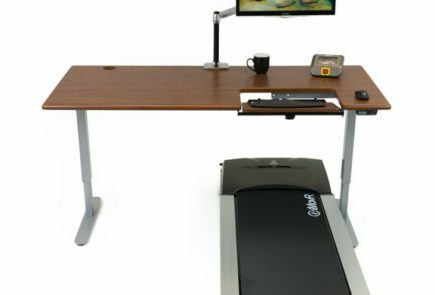 To be blunt we have to categorically reject the notion that anyone could realistically use the DeskMill as a base for a treadmill desk workstation. It's too narrow and too short, despite being oh, so comfortable on the feet. 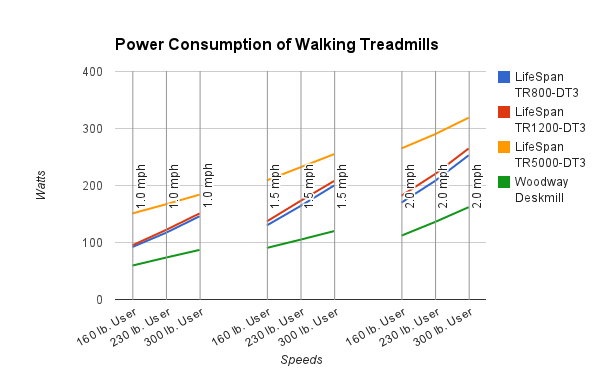 True to Woodway's claims the DeskMill's power draw was significantly lower than any other treadmill we've ever tested. See this chart comparing it to the LifeSpan TR800, TR1200 and TR5000. For example, the Woodway handled a 300 lb. user walking at 2.0 mph with 50% less electricity consumption its nearest rival, the LifeSpan TR5000. We're talking about the difference between 160 Watts and 320 Watts, so about the savings you'd get from having one-and-a-half light bulbs burning versus three light bulbs. We won't bother calculating how many years of continuous use it would take to get an ROI on the $5000 price difference between these two treadmill models but suffice to say it would take a very, very, very long time. There's no question that Woodway treadmills are super quiet at 15 mph, but our readers are planning to use their treadmill desks in an office environment, not a gym. Thus we were crestfallen yet again to learn that this little beast has quite a growl at low speeds. At 2 mph it tipped the decibel meter at 65 dB versus the iMovR ThermoTread GT's whispery 42.7 dB. To be fair this may have been due to continuous creaking sounds we heard from inside the mechanism. But even without this the test subjects felt that the mechanical noise from the DeskMill was far more distracting than the soft white noise that the LifeSpans produce. Usually the loudest thing you hear on a walking treadmill is the footfall, not the belt. Not so with the Woodway, where the sound of the tank tread mechanism itself overpowered anything else. We imagine that Woodway's engineers decided to narrow the belt this much so that the entire treadmill could be tucked under the 30" desktop of their prototype "L" table, as pictured below. Again this table is not something most users will want to buy (it is rumored to cost at least $6,000), and may have been a forcing function in causing Woodway to narrow their belt width too much for healthy long-term usage. Although we will not be reviewing the Woodway's L Desk, according to the manufacturer it is adjustable from 27” to 50” in height, with 3 user programmed desk heights. The wood grain laminated desk surface is available in either maple or cherry. The warranty is only one year for parts and labor. Again, we do not recommend this desk choice for most users, which should by no means reflect on how we feel about Woodway as a state-of-the-art treadmill base manufacturer. Woodway makes excellent sounding arguments on its website for why their product is worth $5,000 more than LifeSpan's TR5000, but the cold hard facts are that this thing is a loud, heavy, rectangular metal box with no industrial design to lend it any appeal in an office environment, devoid of a control console, too small to be usable by a 2-legged human (perhaps a four legged dog might feel comfortable on it), and fails to impress in any aspect other than foot comfort and power consumption. Which treadmill base would you pay $7,000 for? Surprise, that one only costs $2,000. When sitting side-by-side next to a polished, aluminum-framed LifeSpan TR5000 it is very hard to conceive of any consumer opting for the Lilliputian DeskMill. We were saddened to come to this conclusion after getting our hopes raised by the website's description. Perhaps if Woodway would go back to the drawing board we might someday see something that works well enough, and priced correctly to have mass appeal to the treadmill desking community, but it isn't there today. The DeskMill comes with Woodway’s standard warranty of 5 years on the drive, motor and belt, 3 years on all other components, and 1 year on labor. Take a look at WorkWhileWalking's Comparison Review of Walking Treadmill Bases.